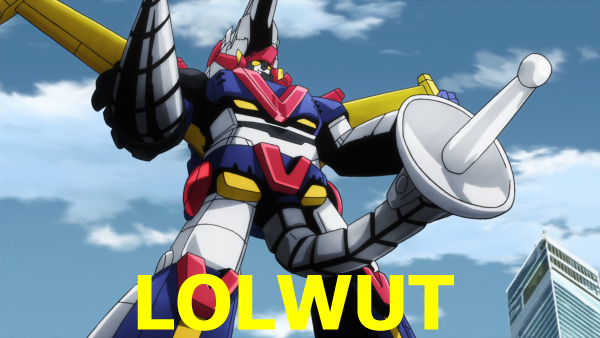 Welcome to the twelfth and final week of the Fall 2013 season of Anime Knockout! Every week, we will review the new anime of the season, rate them, and kick the weakest show off of the queue. Banri, Linda, and Yana are still working in costume at the birthday party. The owner of the place tells Yana to get on the stage for another 10k yen. As Yana starts showing off on the stage, Linda and Banri start laughing and having a good time. Meanwhile, Kaga is trying to call Banri. She has the photo of him and Linda. She goest to Banri’s apartment, but he’s not home. She tries Nana’s door, but she’s not home either. Kaga starts to wander town, looking for Banri. She finds him posing for some suggestive pics with Linda for the partygoers. Kaga throws a drink on Banri and slaps him. How did Kaga find the party? How did she find Banri in that party? This was someone’s birthday party, not a public event. On top of that, Banri was in costume. He was dressed as a maid with makeup and a wig in the middle of a crowd. This is one of those little plot convienences that I have a problem with. Afterwards, there’s a lot of apologizing drama. A lot of it is Kaga going on about herself. Poor Kaga and all of her hard work to be the good girlfriend. “Everything’s ruined!” After a little emotional blackmail, she suddenly paints Banri white again and everything’s fine. Linda meets Banri the next day for another round of apologizing and to clear some things about the past up. Banri wants to pretend that they didn’t know each other in past. Linda tears up the picture, doing what Banri couldn’t bring himself to do. The characters are all realistic enough to make this story work. It really strikes me as the author of this story knowing people like this and changing the names to protect identities. Add in a little amensia drama to make the pitch interesting and you have a romantic comedy featuring a girl with uncontrolled Borderline Personality Disorder and her possibly codependent boyfriend. That’s not going to end well. The animation and production values were good enough that I wasnt’ getting distracted by sudden anime sidemouth or off-models. The backgrounds, while not very full, were detailed enough to paint the picture. I would look at this like a stage show. The opening and closing themes were catchy with a little upgrade to the animation from the main show. I’m really not one for romantic comedies, but I did enjoy Golden Time. Will I continue to watch it? No, it’s just not my thing. Well, this episode was awkward to watch. 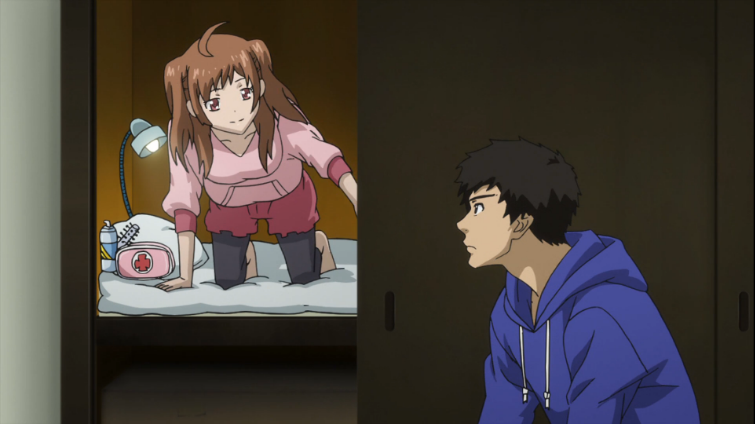 Granted, not as awkward as some of the other anime this season, so I’ll give it that. So Banri, Mintsou, and Linda were already working at this cosplay party. Kaga kept trying to text Banri since she doesn’t know he got a job. Of course, she finds him. How she got into the party? I have no idea. But she caught Banri and Linda in a compromising position so the guests could take pictures. Kaga felt off the handle one again and threw a drink in his face before slapping him. Linda immediately took the blame for everything and since Banri couldn’t leave work yet, he gave Kaga his apartment key so she could wait for him there to talk. There they apologized for what they each did at the party, then argued and cried and whatnot about their relationship, what kind of boyfriend/girlfriend they wanted to be, and how Banri is dealing with his past with Linda. Then Banri met with Linda to confirm some things about their past. The picture of them was torn up, and Banri casually told Linda that they should distance themselves from each other since he wants to sever the connections to his lost past. Even though this anime’s score went down over time. It was actually fairly good overall. Not really my usual thing, but it was enjoyable to watch and didn’t have me cringing the same way some other anime did. The characters, while crazy and odd at times, are still very understandable. I feel like I know these people, so it make the anime more relatable and real somehow. For both Banri and Kaga to not end up with their first loves is a very realistic take on life, since the real world doesn’t usually work out perfectly like say, Kaga wanted. Would I recommend this anime from what I’ve seen so far? Very possible, at least with Valentines Day coming up and people looking for interesting romantic comedies might increase. We get a new opening and closing theme with this episode, reflecting the Power Rangers thing the show has going now. These songs aren’t as catchy as the previous ones and the animations aren’t really that compelling. So, this episode is the usual Super Sentai crap. The team fights a monster, the monster becomes giant, bring in the giant robot, monster blows up. We get a couple of those this episode. There’s also a TV documentary about the team that Goto watches. Mari is staying with Goto, because whatever. Hazama offers the Yellow position to Goto, who turns it down. I’m calling this: Mari takes the job later. The Yellow Ranger is typically female and Mari’s Flamenco Diamond outfit was also yellow. It’s nice to see Goto again. He’s really the one saving grace of this show, now. Hazama does the team building thing. Pink Ranger laughing with the flamethrower and seeming annoyed with her team communicator role was also nice. Thing is, this isn’t the show I started watching and liked. This is some other crappy show. If this is a deconstruction of the sentai genre, it’s spending far too much time playing it straight. Then again, I never liked these shows when I was younger, so I don’t have the warm fuzzy feelings of nostalgia to help sugarcoat this. The production values have taken a hit again. I’m seeing that damn anime sidemouth and the shading and textures look cheap. If this is intentional to reflect the cheap cheesiness of the original sentai live action shows, bravo. I’m convinced that this is crap. 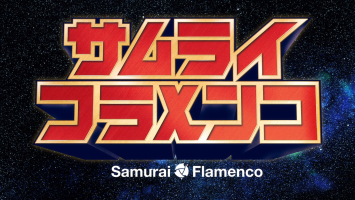 Whatever happened to Samurai Flamenco? His grandfather’s notes and dreams? Hazama’s dreams? Where did that show go? The only reason why this series topped the knockout charts is the very strong start it had. Six episodes of very good, followed by a few episodes of WTF, and now we’re in a rehash of Super Sentai. Did the writers forget about what they started? 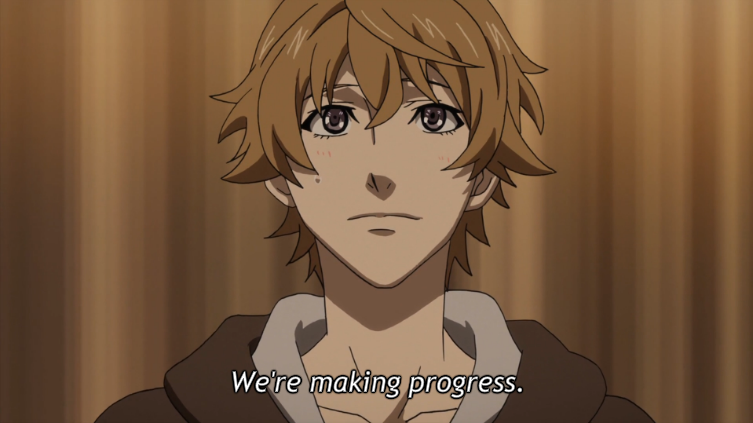 In either case, I’m not going to keep watching Samurai Flamenco after this last review. Okay, so, this show. One minute I’m wondering what the hell I’m even watching and where the heck this anime went, and then another minute we get the old Hazama and Goto duo back, and then the next minute I’m enjoying the Power Rangers thing they’re doing. How did this anime manage to do this? Weirdly enough, after twelve episodes and all the weird plot twists they’ve thrown in, this anime is still enjoyable to watch. Mari is now living in Goto’s closest as her place to hide out for a while. For some reason I think his girlfriend knows about this. He’s still talking to his invisible girlfriend through text messaging. Hazama is still keeping in touch with Goto and tried to offer the Yellow Ranger position to him, to which Goto said no instantly. At the moment I was going to guess Mari was going to go from Flamenco Diamond to Flamen Yellow on the new team. Though I’m not sure. 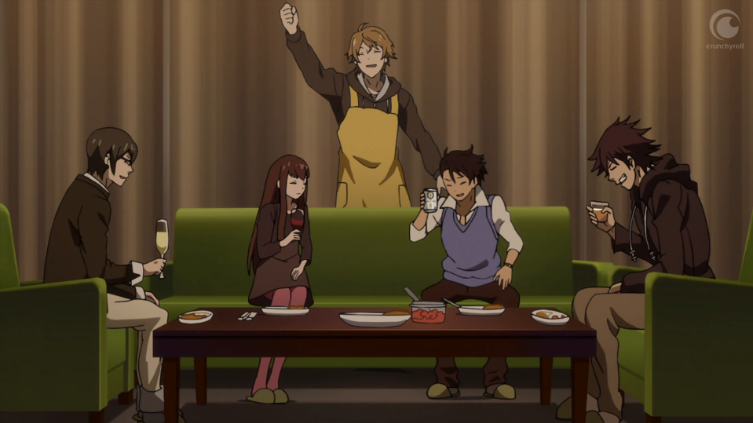 In the end Hazama finally got his team member to come over to his place so he could make curry for them. There’s a new opening and ending theme. Not sure if they’re better than the old ones. 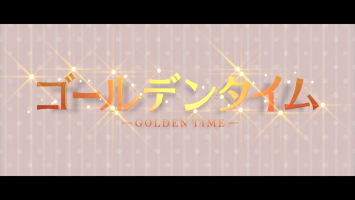 Golden Time is our runner up in the Anime Knockout and Samurai Flamenco is our winner for the Fall 2013 season!